Casey in this blog will share with you how to use creatine. Casey will also answer the question, "Is Creatine Bad For You?". The web server with the IP-address 212.1.208.141 used by Caseyatwood.net is run by Hostinger International Limited and is located in USA. This web server runs 4 other websites, their language is mostly english. Two websites on this web server are not suitable for minors. 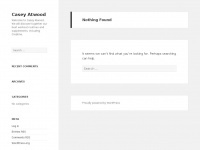 Because Caseyatwood.net was not classified as a website for adults, the proximity to other adult websites could impact the classifcation of this website negatively.